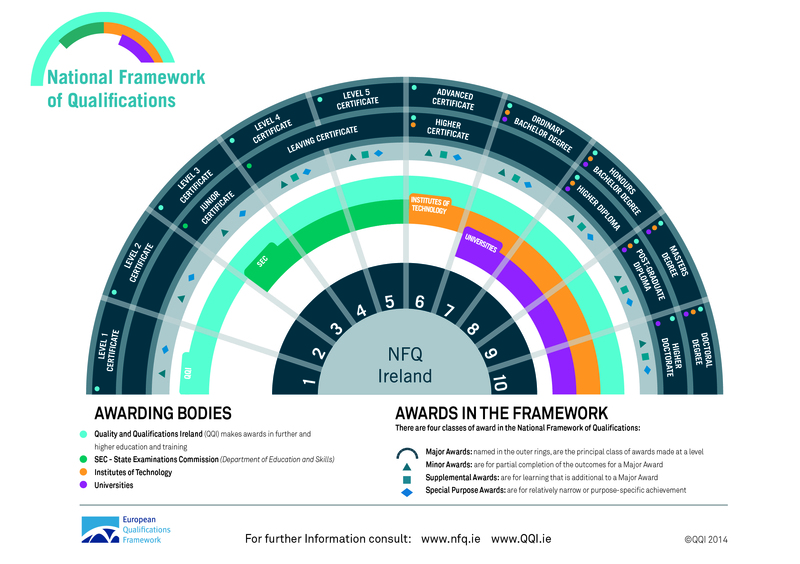 The National Framework of Qualifications (NFQ) is the ten level system (1-10) giving an academic or vocational value to the qualifications obtained in Ireland. The NFQ levels help to indicate how an award can be used for training, education and employment opportunities, and allows for a comparisons and equivalencies to be drawn between different awards, courses and programmes. The diagram above shows a “fan” representation of the National Framework of Qualifications. Quality and Qualification Ireland (QQI) is responsible for maintaining the NFQ and is the regulatory body for external quality assurance in further and higher education. The majority of courses offered in the college are accredited at QQI Level 5 and Level 6. Some courses have accreditation from other awarding bodies. The NFQ allows for this accreditation to be given an equivalency within the framework that is clearly understood by students and employers. 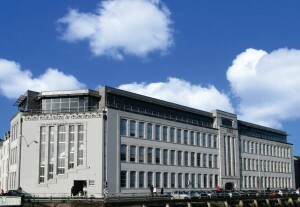 Cork College of Commerce is justifiably proud of the progression options that it has established for its students. On average 400 students each year use our progressions links to continue on to University and Institutes of Technology. Learning does not end when the student leaves our college. An additional benefit of attaining a qualification from Cork College of Commerce is that it provides an alternative route to Higher Education. From generating up to a maximum of 390 points for the CAO application system via a QQI award, to local agreements with Higher Education Institutes, students can progress to specified courses in a range of areas. The Progressions Officers in the College are constantly reviewing and sourcing new links to Higher Education and continually updating the progressions database with information on available routes for students to higher education. New opportunities have been identified in Scotland and in the Netherlands recently which will be reflected on our links database. Check out the progressions database or contact our progressions officers Niamh or Roisin at progressions@ccoc.ie with your queries. CIT CCPS (Cork Colleges Progression Scheme) which is a special scheme for our graduates on selected courses. Entry is dependent on their QQI qualification received from us rather than the points issued by CAO. Link courses include Business, Computing, Hospitality, Professional Cookery, Art, Health and Humanities. WIT Progressions Agreement – This facilitates our graduates on selected courses which are dependent on their QQI qualification received from us rather than the points issued by CAO. Link courses include Business, Science, Computing, Health and Humanities. IT Tralee Advanced Entry Agreement – Advanced entry arrangements are in place between IT Tralee and CCOC for selected courses in areas such as Tourism, Business and Early Childhood. Griffith College Advanced Entry Agreement – An advanced entry arrangement is in place between Griffi th College and CCOC for their Business studies degree. University of Huddersfield – Entry arrangements are in place between Huddersfield and CCOC for selected courses including Marketing, Event Management, Advertising and Logistics. These include year 1 and year 2 entry. InHolland University of Applied Sciences – Our computing students, both at Level 5 and 6 are eligible to apply for year 2 and year 3 respectively both for the Mathematical Engineering degree and the Information Technology degree with InHolland University. New links will continue to be developed with other universities in Holland in diff erent disciplines. Nursing CAO and UCAS – On average almost 50% of our nursing graduates progress to Nursing degrees in Ireland or the UK. See the website for current progression opportunities. Psychology in Scottish Universities – The Level 5 in Psychology and Social Studies is linked to Psychology degree programmes in some Scottish Universities. For further links see our progressions database.